Garry Bell, VP Corporate Communications and Marketing, Gildan presents Feng Chen with a scholarship. 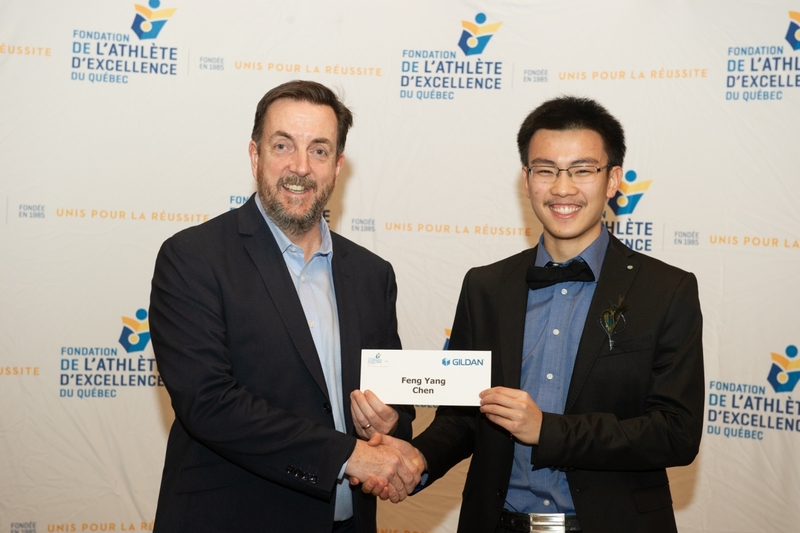 Gildan recognized six young student-athletes during the annual Foundation of Athletes for Excellence in Quebec (FAEQ) gala on November 29. The outstanding student athletes achieved strong athletic performance and outstanding academic results while demonstrating strong leadership in their communities. This year, the Gildan Leadership Category bursaries totalling $12,000 were presented to university students to support their continued academic and athletic endeavours. Gildan has now donated more than $130,000 over the past 10+ years to the Foundation and is proud to support passionate, motivated students that demonstrate a unique capacity to improve the lives of those around them. The focus on youth and leadership is one of the areas that Gildan invests in, hoping to inspire and support the potential that youth have to dream big about the world they want to create. Nicole Hewlett: Studying anthropology at McGill and a varsity hockey player, Nicole volunteers at the McKay rehabilitation centre for kids, which supports children with physical disabilities and motor impairment. “I love working with children, because they can sense when you care about them, have empathy and are trying to make a difference,” said Nicole. Her future plans include working to promote women’s health issues. IN 2018, the FAEQ provided over $1.4 million to 475 student-athletes in Quebec ranging in age from eleven to twenty eight. To learn more about these young leaders, watch their videos here. Learn about Gildan’s other Youth Leadership initiatives here.